Bernard Finch was a handsome doctor working in the San Gabriel Valley. Carole Tregoff was the beautiful assistant who became his mistress. 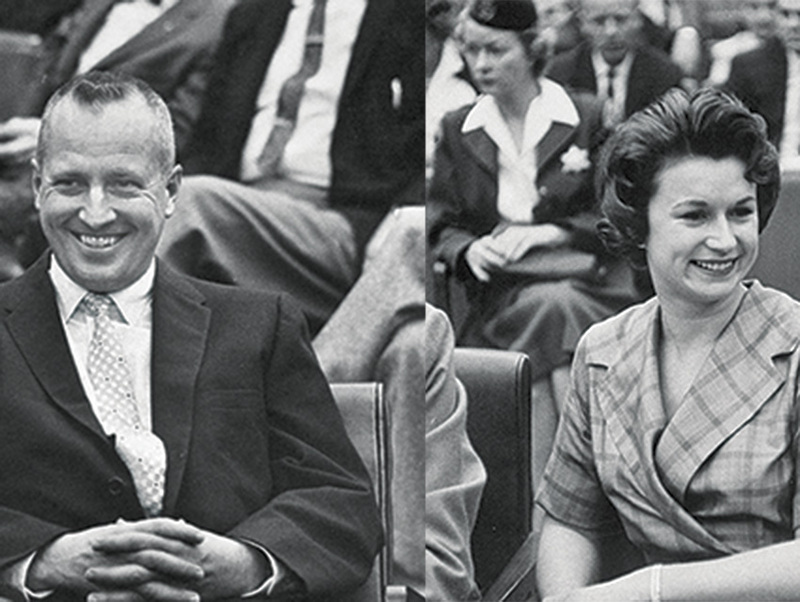 When they murdered Finch’s wife in 1959, the pair set in motion one of the most sensational trials the country had ever seen—before being all but forgotten. It’s hard to imagine the twin towns of Covina and West Covina as playgrounds for Hollywood luminaries, but so much of this valley known by Cliser, a stocky 55-year-old native with a graying goatee, has evolved from a white middle-class community to one that is increasingly blue-collar Latino. Cliser may as well be describing daily life in Atlantis when he talks about the backyard barbecues of his youth and the monthly pilgrimages grown-ups made to Las Vegas, along what was then a two-lane mountain highway. Then he tells me about the picture that changed his life. In 1959, the woman in the photograph was his family’s next-door neighbor. Carole Tregoff, a tall redhead, was 22 years old, a prominent surgeon’s secretary, and a murder suspect in the year’s most talked-about crime. She and Dr. Bernard Finch—Tregoff’s 41-year-old lover and boss—were charged with killing Finch’s wife, Barbara. Reporters from across the country and Europe descended upon Los Angeles’s new Hill Street Superior Court building as well as on West Covina. Dorothy Kilgallen, whose experience in trial coverage for the Hearst syndicate stretched back to the Lindbergh kidnapping case, reported on the trial, as did British spy novelist Eric Ambler for Life magazine. Perry Mason’s producer and writers showed up. Each day the courtroom was packed to its 250-seat capacity with dozens of reporters and spectators who’d begun lining up before dawn. Then, with the rap of a judge’s gavel, it was over. This story of homicidal lust that gripped America midway between the Sam Sheppard case and the Manson Family murders was all but forgotten—today you can’t locate its traces with a metal detector. Except, that is, in the San Gabriel Valley, where its lurid, tragic details continue to haunt people old enough to remember them. That’s another thing: Carole Tregoff continues to live in the neighborhood—she’s even in the phone book, under a different name, as though she could not dream of a life outside this valley. It was at the country club that she and Finch parked their car and walked up the steep slopes of 2750 Lark Hill Drive to the doctor’s home on the night of July 18, 1959. There, in the garage of the low-slung, rectangular house he had designed for his family, the doctor pistol-whipped his 35-year-old wife, fracturing her skull before she fled to Finch’s parents’ home next door. Barbara almost made it, but a .38-caliber slug fired into her back had severed an artery, and she collapsed near a stairway leading to her in-laws. Bernard Finch was soon sprinting pell-mell across the golf course’s manicured greens before fleeing town on the new San Bernardino Freeway. Tregoff, the secretary who dreamed of becoming the new Mrs. Finch, would spend the next six hours cowering behind a bougainvillea bush, unseen by the police, the coroner, and the dead woman’s two children. East covina had always been the kind of town where, as people often say in nostalgic civic histories, no one ever locked their doors at night. But it had been changing rapidly since World War II into a new California phenomenon that Nation writer Andrew Kopkind would call “the glassy, grassy flatland suburbs beneath the mountains, where even the palm trees are imported.” West Covina’s population in 1950—two years before Finch built his home in South Hills—was 5,000; by 1960, when his trial began, it was 50,000. Finch easily bridged the old and young Covinas, the farm village and the glassy suburb: His family had been here since the 19th century; the doctor’s father was a retired optometrist who owned a jewelry store on the main drag, Citrus Avenue. The Covina Argus Citizen, as it did with many sons of the local gentry, dutifully noted young Bernard Finch’s social progress, from his birthday parties as a child to his becoming vice president of the Masque and Dagger drama club in high school. It announced his matriculation to La Verne College as a premed student in 1935. In 1943, he graduated from medical school at the College of Medical Evangelists, today known as Loma Linda University. “Bernie” spent World War II as an army surgeon stationed with his family in North Carolina; years afterward, his military crew cut and trim physique became familiar sights at Southern California’s amateur tennis tournaments, where he was a formidable player.